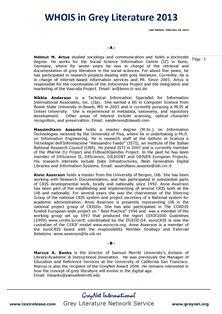 WHOIS in the field of Grey Literature is a compilation of biographical notes provided by authors in the International Conference Series on Grey Literature and The Grey Journal. This online resource is maintained by TextRelease, the Program and Conference Bureau. Records in this directory appear in alphabetical order by last name of author and each record contains a current email address. Should an author wish to revise his/her entry or should a new record be added, please contact info@textrelease.com.